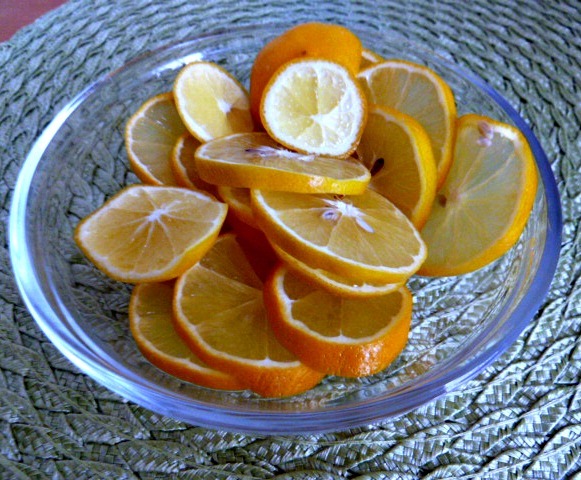 Meyer Lemons are now in season. We still had two Meyer lemons left from the package that I bought. We knew that we wanted to use it in a chicken dish, because chicken and lemons are such a good pairing. I had to look no further than the cover of the January/February issue of Cooking Light to see this Meyer Lemon Chicken dish. The dish has a bright, sunny flavor to give your cold or cloudy Monday a punch, and give you a healthy does of Vitamin C. If you don't have any Meyer lemons, you can use regular lemons. and add a little sugar. Scott was the Chef, and I was the Sous Chef. 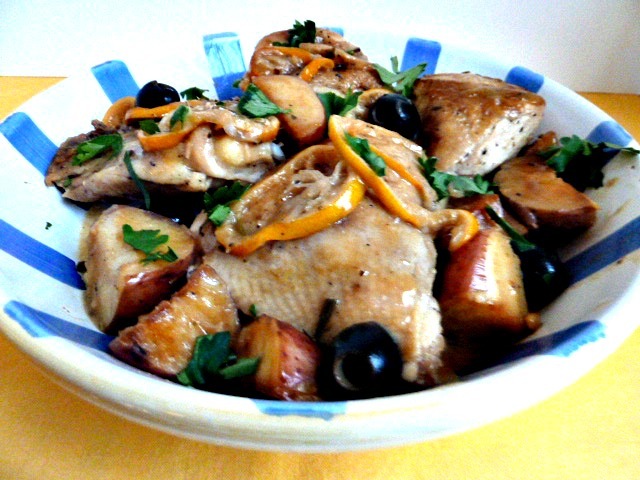 The dish has chicken pieces, browned baby potatoes, olives, and a Meyer Lemon sauce. The recipe called for Castelvetrano Olives, but my grocery store didn't have them, so we used black olives. The olives do give the dish a little zing with the lemon sauce. The recipe takes time to prepare and has a few steps. Cooking Light greatly underestimated the total prep and cooking time. It took almost two hours to prepare from start to finish, but well worth the effort and time. We left the skin on the chicken, for moister chicken, and then removed the skin, when we ate the chicken. The moist chicken with browned baby potatoes and the olives, topped with the wonderful Meyer Lemon wine sauce makes for a stellar dish, fit for company. The Meyer Lemon wine Sauce makes the dish. 1. Heat a large ovenproof skillet over medium-high heat. Sprinkle chicken with 1/2 teaspoon salt and 1/2 teaspoon pepper; coat with cooking spray. Add chicken to pan, skin side down; cook 6 minutes or until skin is golden brown and crisp. Turn chicken over. Place pan in oven. Bake at 400° for 12-18 minutes or until a thermometer inserted in thickest portion of chicken registers 165°. 2. Remove chicken from pan; keep warm, covered with foil. Remove excess grease( do not wipe pan clean). Add 1 tablespoon oil to pan; swirl to coat. *** Add potatoes to pan; sprinkle with 1/4 teaspoon salt. Cook potatoes 3 minutes on each side or until browned. Remove potatoes from pan. Add lemon slices to pan; cook 1 minute on each side or until browned. Remove lemon from pan. Add remaining 1 tablespoon oil to pan; swirl to coat. Add shallots and garlic; sauté 2 minutes, stirring occasionally. Add wine to de-glaze pan and add thyme; cook 1 minute or until liquid reduces, scraping pan to loosen browned bits. 3. Return potatoes and lemon slices to pan. Add 2/3 cup stock, remaining 1/4 teaspoon salt, and remaining 1/4 teaspoon pepper; cook 2 minutes or until potatoes are tender. Combine remaining 1/3 cup stock and cornstarch, stirring with a whisk. Add cornstarch mixture and olives to pan; bring to a boil. Cook 1 minute, stirring occasionally until the sauce is thickened. Add in lemon juice and butter, stirring until butter melts. Return chicken to pan, turning to coat; sprinkle with parsley. Here is an alternative method to save time cooking the potatoes. While the chicken is baking in the oven, place the cut potatoes into a pot of boiling water; cook for 5-7 minutes or until fork tender. Remove from the heat, drain potatoes, and set aside. Add 1 tablespoon oil to pan that chicken was cooked in; swirl to coat. Add par-boiled potatoes to pan; sprinkle with 1/4 teaspoon salt. Cook par-boiled potatoes 3 minutes on each side or until browned. Remove potatoes from pan. One of our favorite additions is our Meyers lemon tree. I love the chicken grilled after being soaked in it. This is a must try! Book marked! Lemon and Chicken are such a beautiful combination...it's like they were meant to be together. This looks delicious, I will definitely have to try. Thanks for sharing! You are welcome! Please let me know, if you make it, and how you like it. Oh, I've so wanted to make this recipe but I haven't found meyer lemons around here. Now you've made me want to make it even more! Your dish looks fantastic. OOhh!! BEcky!! This looks fabulous!! While I don't have Meyer Lemons in my back yard, I do have a tree filled with lemons begging to be used. I can see my whole family loving this. And... with my trip to the farmer's market next weekend I'm thinking a bag of Meyers just might be on my list! We made this dish on the weekend, and we had leftovers for the week. It is Zero today, so we need anything that will remind us of warm sunny days! I only have two left from my tree, I will go buy some so I can make this soon. Lemon and olives, yes now that is a combo. Plus lemon has a way of cheering us up, doesn't it. You are lucky you have a cook making these things for you. Happy Tuesday Becky! You are so right about lemons cheering us up. 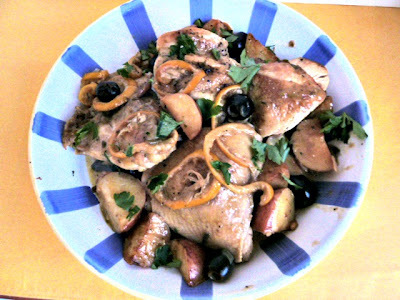 Today the temps aren't even above 10 degrees, but I had leftover Meyer Lemon Chicken for lunch:) Happy Tuesday to you, too. This looks outstanding! Looks delicious. Thank you for sharing this to us Gina. Thanks, Dorothy! 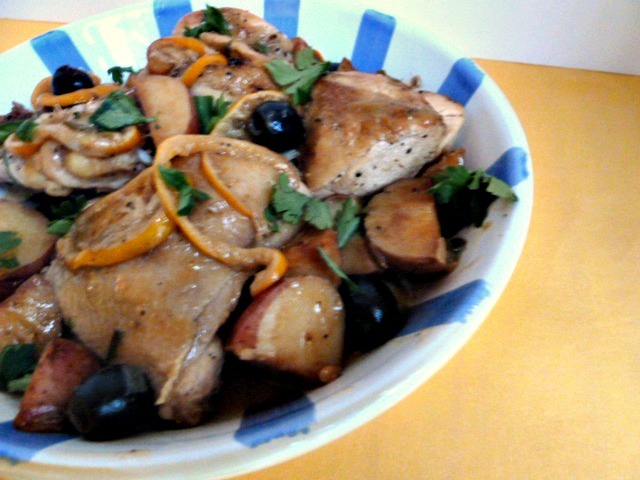 this chicken is good and full of lemon flavor!